IN A WORLD where power dynamics call for strong, capable leadership, the workplace is where the first nuances of building character and leadership traits are nurtured. Tomorrow's generation needs to know and relate to people that can inspire them to outstanding success. We all need role models. Business leaders, particularly successful business women, need to connect with the young women leaders of tomorrow. 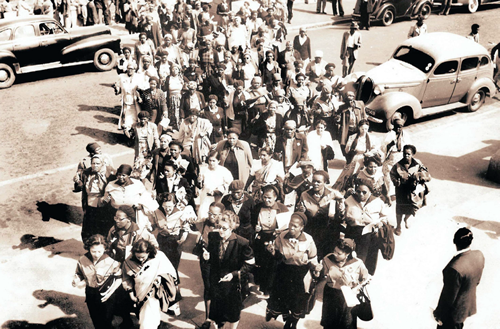 As we celebrate the 60th anniversary of the 20 000 women who marched on the Union Buildings in 1956 to protest against the pass laws and demand equal rights, it is heartening that our country is a beacon of hope for women's rights the world over. In most fields, from big corporations listed on the JSE down to Parliament, local municipalities and boards, women have become a force to be reckoned with. However, there is much work to be done. We still have some distance to go before women are impartially afforded the opportunities which would maximise their potential. But it is so exciting that women's talent is in such abundance that it cannot be ignored. British-born anti-apartheid activist Helen Joseph leads a march by more than 20 000 women to the Union Buildings in Pretoria to protest to the then Prime Minister JG Strydom, the extension of pass laws to black women on August 9, 1956. The question is, what do women do when they are at the top? What should women do with the power of the throne? And here's a proposition worth thinking about: women do not want to be respected for their throne, but for their power, for their strength. There is a big difference between the power and a throne. Our power is that our country needs our contribution of building the economy; and to address the broken communities. Power enables women to say: "I am in charge, I am accountable." The throne is the unity a woman has when she has the power. So the more women come together, the stronger they become, the greater respect they command and the more we all achieve as a society. That is why women who have achieved success at high profile tech firms can easily become the ideal role models for the young women of today so that they become an even bigger force to be reckoned with. How can women leaders propel more women to the power of the throne? For many years I have been fascinated by how natural it is for young athletes to view successful older athletes as role models. The 21st century young women and young women executives are bombarded with media and information - movie stars, singers, models and celebrities top the list. It is a form of hero worship. My question is simple: Where have all the business role models gone? Why don't young women corporate executives seek out role models in the industry? I'm not sure I have an answer. But what I do know is that there are two key benefits to role model power. Finding a positive role model can inspire the development of young women corporate executives. As senior women business executives, regarding charting a path as a model can inspire and set good examples to those around you. My advice to young women is to find a role model who is an advisor, who is consistently in a growth mode. The power of role models is fascinating. Women who have role models pattern themselves after this person. They model their dress, work ethic, goal focus, mannerisms, professional designations, services, interpersonal communication skills, and more. As they endeavour to model their professional hero, a metamorphosis occurs. They turn into role models themselves. Indeed, today's women executives come equipped and empowered with skills. They need dependable role models more than ever, because they have limitless opportunities and they need to be able to sift through to get to a career that not only inspires them, but also drives them to achieve outstanding results. There are many reasons why positive women role models are needed in our times. We have more women passing out of higher educational institutions than men. More women join the labour force. Indeed, women, who are successful in business, are also empowered to be leaders in their communities and countries. I know that women must also grapple with gender specific issues that come into conflict with career options. Marriage, motherhood, reliable child care and domestic chores are issues that face every woman who has considered a serious career. The World Bank has said that about 1 billion women are unable to achieve their full economic potential due to barriers such as unequal access to opportunities and credit, a lack of sufficient education and training, and a lack of help from communities and governments in entering the workforce and the economy. However, equipped to multi-task, women still find balancing it all a hard act to follow. Unless driven by a passion and a commitment to a goal, most will settle for less glamorous yet dependable jobs that will allow them to stick to regular hours. Some even give up on a career altogether - a few others consider returning to work once the children are grown and their domestic chores lessened. Despite these challenges, many women have achieved a level of success that surpasses such boundaries. We have solid role models girls and women can be inspired by. For anyone running a business it would be wise to think about growing female power and how it might contribute to future business success. Women want a fair slice of the main economy of our country and want to be accorded the necessary respect in the community There is no need to be afraid of women's strength, the power of the throne, but rather to respect it. Women numbers are significant enough for women to hold hands together and exercise their power. We must utilise the power of unity to motivate others and celebrate, rather than be prophets of doom. The key part of the solution is unleashing the economic power of women and for some to become role models. Today there are many converging studies - from the World Bank to the World Economic Forum, from think tanks, universities and corporations - that show that investing in women is a powerful yield investment. Investing in women, and particularly women entrepreneurs, is not only the right thing to do, but the smart thing to do. Women-owned small and medium-sized enterprises drive economic growth and create jobs. Other think tanks have concluded that women's participation in the workforce and in income generation boosts economic growth and has an impact on society as a whole; equal access for women to land and other agricultural inputs increases agricultural productivity by 20 percent or 30 percent and reduces the number of people suffering from hunger; companies with three or more women among their directors or top managers have 53 percent more output than companies with no women. Nothing is considered more relevant than discussion, and above all, action to promote women as drivers of inclusive growth within their countries. Empowering women is one of the most effective and positive forces for reshaping the globe. Therefore, young women executives will benefit tremendously from being exposed to smart, articulate, independent and stable women who have achieved success. Let powerful women empower others. Let powerful women encourage others to express themselves openly. * Dr Anna Mokgokong is chairwoman of the Afrocentric Group, which owns Medscheme and other health companies.